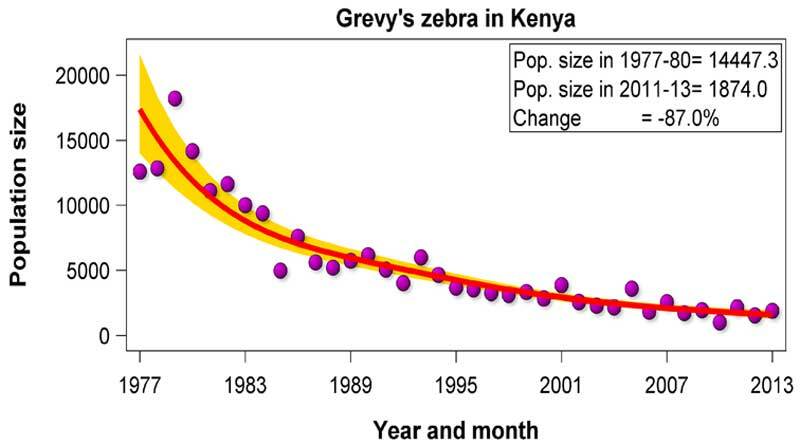 The number of Grevy’s zebra in Kenya have fallen disastrously since 1977, research shows, amid evidence of escalating wildlife losses worldwide. Researchers, writing in the open-access peer-reviewed journal PLOS ONE, noted that extreme wildlife losses had recently been documented across large parts of Africa, including western, central and eastern Africa. The study team from the International Livestock Research Institute in Nairobi studied wildlife numbers on Kenya’s rangelands between 1977 and 2016. Their findings showed extreme declines in wildlife, while over the same period livestock numbers had risen. Their work was based on the analysis of data collected by systematic aerial monitoring that collectively covered 88% of Kenya’s land surface. “Our results show that wildlife numbers declined on average by 68% between 1977 and 2016,” Joseph Ogutu and his colleagues reported. They said the declines now severely threatened the population viability and persistence of Grevy’s zebra, warthog, lesser kudu, Thomson’s gazelle, eland, oryx, topi, hartebeest, impala, and waterbuck across Kenya’s rangelands. Grevy’s zebra numbers fell from an estimated 14,447 in 1977–80 to just 1874 by 2011–13. This represents a 87% decline. Since 1977, cattle numbers decreased by 25.2% but numbers of sheep and goats rose 76.3%. Camel numbers rose 13.1%, while donkey numbers increased 6.7%. “As a result, livestock biomass was 8.1 times greater than that of wildlife in 2011–2013 compared to 3.5 times in 1977–1980,” the study team reported. The researchers said causes of the wildlife declines included exponential human population growth, increasing livestock numbers, declining rainfall and a striking rise in temperatures, but the fundamental cause seemed to be policy, institutional and market failures. They thoroughly evaluated wildlife conservation policy in Kenya and suggested a range of interventions likely to succeed in reducing the declines and restoring rangeland health. Most notably, they suggested strengthening and investing in community and private wildlife conservancies in the rangelands.